Enjin is a Singapore-based IT company founded in 2009. It is one of the largest gaming community platform that supports over 250,000 gaming communities and around 18.7 million registered gamers. Enjin Coin (ENJ) is much more than just a cryptocurrency — primarily used for creating blockchain assets. While it can be used as a method of payment, ENJ’s core purpose and function are as a token that can be used by developers, business people, and entrepreneurs to mint crypto assets. 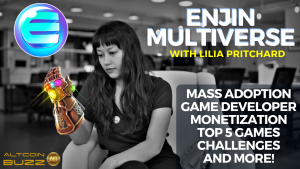 These assets can be used for a multi-purpose: by games as characters, weapons or vehicles; by retail as collectibles, memberships, or vouchers; and by any business that can benefit from rewarding their customers or employees — to name just a few and furthermore the gaming assets can be used cross-games in the ‘Multiverse’. As an all-in-one blockchain game development platform, Enjin can help build games, websites, forums, stores, content management systems (CMS) among others. In the current gaming outlook, players’ items are restricted within the walls of centralized databases. Players do not have the freedom to use their items in multiple games and cannot see or prove their rarity. Players don’t truly own their items and risk losing them at any time in case a game shut down or kick them out. The transparent, decentralized blockchain and blockchain-based items created with Enjin Coin bring the perfect solution to these problems. 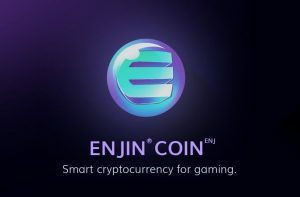 Enjin Coin brings blockchain to gaming which helps to reduce the high fees and fraud that’s prevalent in the transfer of virtual goods. The Enjin team comprises of blockchain technology and crypto enthusiasts. Maxim Blagov and Witek Radomski are the founders of the company, with decades of experience in the field of gaming technology and development. 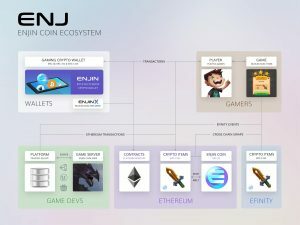 The developers of ENJ envision it to be the most usable cryptocurrency for the gaming industry. They are partnered with Unity and awaiting final certification before GDC 2019. Over 15 games are already being built using enjin’s technology and are raising funds using ENJ to sell game items that also backed backed by ENJ. Enjin Coin is an ERC20 token built on the Ethereum network. With that, the project not only acts as a digital currency but also has smart contract capabilities. A collection of smart contracts comprises of Payment Gateway Contact, Smart Wallet Contract, Custom Coin Registry, Subscription Contract, the Mint, and ‘TopList’ Contracts. Enjin hosts a public platform API using the JSON-RPC protocol to facilitate methods like checking account balances and accessing the above smart contracts. The Enjin Coin platform provides a list of features through its public API and SDKs. Though, we’ll only be discussing a few of the major ones in this article, to keep things brief. Virtual Goods: The largest value Enjin Coin brings to the gaming community is in its creation and management of virtual goods. Developers on every platform can easily design and create a currency unique to their respective community which is in turn backed by ENJ as the parent currency. This gives the crypto coins all the benefits of the blockchain while also allowing customization as per the respective platforms.y smart contract so they are recognized by all Enjin Smart Wallets. Furthermore, a user can exchange virtual goods for Enjin Coins at any point in time. This builds an interconnected ecosystem of games and communities where one can even transfer assets across platforms (more on this below). Payment Gateway: Beside the virtual assets, the Enjin Coin SDK also includes a decentralized payment gateway. This gateway is robust and allows a user to create customized invoices, carts and refund plans. It also provides a widget to trade and exchange Enjin Coin and/or Customized Coin payments on your website. The payment gateway charges a very nominal fee in Ethereum on each transaction. Smart Wallet: The Enjin Smart Wallet is the component that connects all the modules together by supporting the virtual goods from all Trusted Platforms of the user. It is also synced to user Ethereum address and hence allows a user to access coins and assets outside of the gaming environment using smart wallet. You can buy ENJ in exchange of Bitcoin (BTC) or Ethereum (ETH) on major exchanges such as Binance, Kucoin, and Liquid. In case you don’t own any BTC or ETH, you should first buy some with USD on a platform like Coinbase Pro (earlier GDAX). You can buy and trade ENJ on enjin wallet as well, there are 3 token swap services Changelly, Kyber and Bancor. 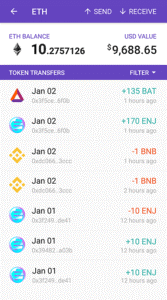 You can avail multiple wallets to support and store ENJ as it is an ERC 20 token. MyEtherWallet is a popular online wallet along with other options like Jaxx and Eidoo. However, Ledger Nano S provides extensive support as a hardware wallet for ENJ coins. 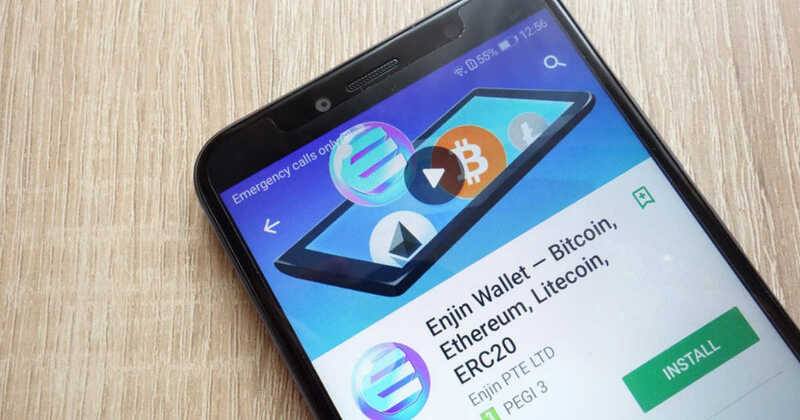 Though, one is ideally advised to use the official Enjin Wallet which is available for Android and iOS mobile devices. Apart from ENJ, you can also store BTC, ETH, LTC, as well as all ERC20, ERC721, and ERC1155 tokens in the wallet. The team is expected to continue to add support for other altcoins too. 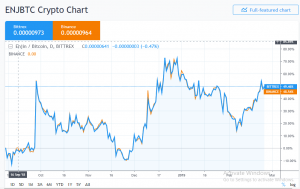 Enjin Coin has had a fairly anticipated trading run since its launch in November 2017. It followed the market with a huge run up in early January 2018 before falling all through 2018 to its current price of about ~$0.07. In a more bullish market now, additional product releases and partnership announcements may lead to an increase in the price. And, of course, more people using Enjin Coin in online gaming should positively affect the price as well. As of Jan 2019, ENJ tokens have a total supply of 1 billion coins, of which ~762 million coins are already in circulation. Multiple market analysts and enthusiasts believe that ENJ should be approached with caution because of its erratic historical trend and predicted decline over the near future, it would not serve heavy returns on the current investments. Nevertheless, Enjin Coin is adding the benefits of blockchain to the over $17 billion virtual goods economy. And looking at its current achievements and team, Enjin Coin could have a bright future ahead! However, investors should always do their own research before investing in cryptocurrency. All cryptocurrencies, including Bitcoin, are inherently volatile. Historical data is not indicative of future results. So better is to never invest more than you can afford to lose.